Potato, Bacon, Caramelized Onion & Toasted Walnut Pizza - A recipe from Savor California, the online showcase for extraordinary gourmet foods and beverages from California. In a small bowl, dissolve yeast and honey in the warm water and set aside. In the bowl of an electric mixer fitted with a dough hook, combine flour and salt. Add oil and yeast mixture and mix on low speed until dough is bouncy and smooth, at least 15 minutes. Transfer dough to a large bowl, and cover with a clean, damp kitchen towel. Place bowl in a warm spot, and let rise for 30 minutes. Divide dough into four balls, about 6 ounces each. Work each ball by pulling down the sides and tucking under the bottom of the ball; repeat 4 or 5 times. On a clean, unfloured surface, roll the ball under the palm of your hand. Cover with a damp towel, and let rest for 15 to 20 minutes. Roll out each ball on a floured surface and place on an oiled baking sheet. 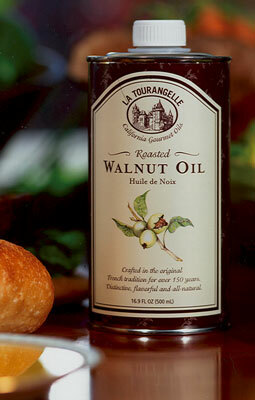 Brush with a thin coat of walnut oil. Sprinkle onion slices with a generous pinch of salt and saute on medium-low heat with about 2 tablespoons of olive oil, stirring often, until onions turn a dark caramel color, about 45 minutes. Lay bacon on a parchment-lined sheet pan and bake at 325 degrees Fahrenheit for about 20 minutes or until crispy. Cool and chop into 1/4-inch pieces. Cover potatoes with salted water. Add garlic and bay leaf, bring to a boil and simmer until just done. Cool and slice into 1/8 inch thick rounds. Spread caramelized onions generously on rolled out pizza dough. Make sure you use enough onions as they act as the sauce for this pizza and too few can leave you with a dry crust. Scatter the potato rounds and bacon evenly over the pizzas. Sprinkle generously with asiago cheese. Bake for 15 to 20 minutes or until crust looks crispy and lightly browned. Cut into wedges and sprinkle with fresh chopped parsley and thyme, if desired.